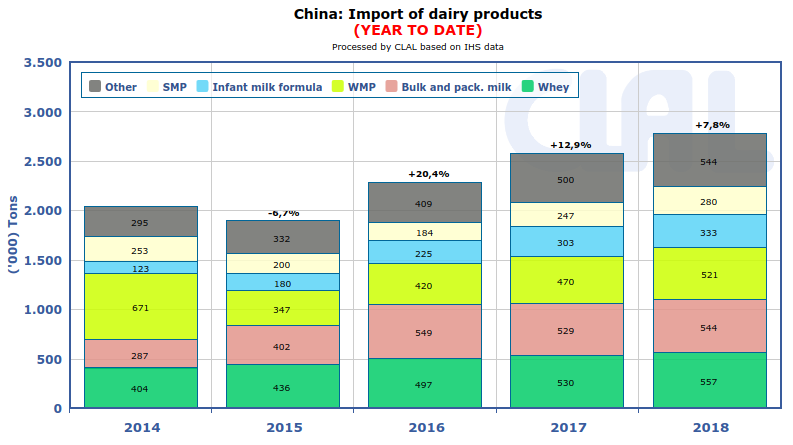 Chinese dairy imports continue to grow: 2018 ended with an increase of +7.8% in volume and +14.5% in value. Regarding the political situation between Beijing and Washington, the tensions on tariffs slow down dairy exports from North America to China, with a decrease in milk equivalent that goes from 455,799 tons in 2017 to 385,728 tons in 2018. Oceania and the European Union benefit from this situation, with the latter moving from 1,377,870 tons in 2017 to 1,529,406 tons in 2018. Also significant is the increase in imports from Belarus, which in 2018 amounted to 8,108 tonnes of WMP and 25,218 tonnes of Whey. Overall, whey, packaged milk and WMP remain the main imported products. The Whole Milk Powder (WMP) recorded the largest increase, continuing the trend undertaken in 2017. Imports of Skimmed Milk Powder (SMP) also increased significantly, albeit at a slower rate than the previous year. The commercial flow of SMP from Europe to China was very positive: +20.2%, which brings the EU-28 to 30% of the market share. The only two products which did not record a significant increase were Cheese, stable, and Cream, which after the increase in 2017 had lower imports, but still remaining at high values when compared with the historical data. Although the Cheese market has remained stable overall, the EU-28 has exported 12.5% more, reaching 16.6% of the market, third after New Zealand and Australia. Considering the percentage variations, Lactose recorded the greatest increase in the year 2018, but coupled with a reduction in prices (USD / ton). The last quarter of the year confirmed the progression of Beijing’s import, which has always increased since 2016: +9.7% on a trend basis, with the powders registering the greatest growth in volume, perhaps thanks to the auctions launched by the European Commission. December contributed significantly to the annual growth: the quantities imported increased by +15.5%, while the increase in value was + 11.1%. In December, WMP imports doubled: New Zealand was the main supplier, with an 88.4% share for the full year.